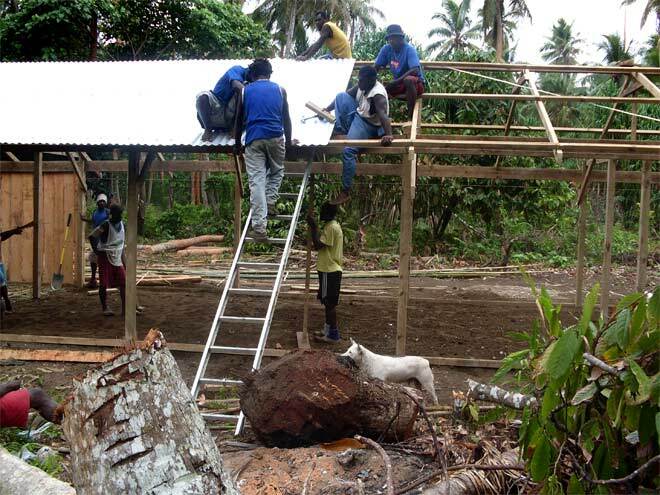 Students from a local rural training college are shown constructing a soap factory in Lohvari village on Ulieveo Island, Vanuatu, in 2008. The factory, for the Palm Project, was used to produce an anti-bacterial coconut soap, based on locally sourced oil. The soap was used to prevent skin infections, scabies and lice, all of which had been increasing in the area. Funding for the factory came from NZAID and the New Zealand Children's Health and Education Trust (a non-governmental aid provider that works in remote communities). New Zealand volunteers were involved in the design and management of the project.